BioAssay Systems is going green. Printed protocols and MSDSs will no longer be included with kits. Starting January 1, 2018, protocols and MSDSs will only be available online. • Sensitive and accurate. 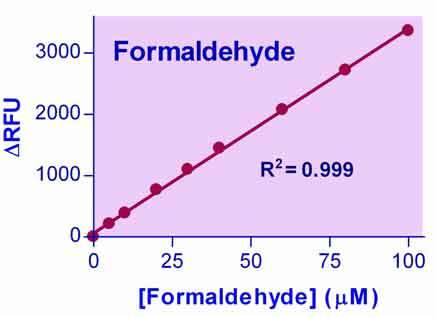 As low as 1.5 μM (45 ppb) formaldehyde can be quantified. • Homogeneous and convenient. "Mix-incubate-measure" type assay. No wash and reagent transfer steps are involved. • Robust and amenable to HTS: Can be readily automated on HTS liquid handling systems for processing thousands of samples per day. • FORMALDEHYDE (methanal) is the simplest aldehyde. It is widely employed in industry for wide range of applications. Formaldehyde is also used as a disinfectant and is a commonly utilized tissue fixative and embalming agent. Formaldehyde is naturally present in all tissues and body fluids. Recently it has been shown that some cancer types exhibit elevated formaldehyde levels. Increased formaldehyde concentration in urine has been associated with prostate and bladder cancer. Thus, measuring formaldehyde in urine can be a very useful tool when studying cancer. BioAssay Systems newly designed Formaldehyde Assay Kit provides a convenient fluorimetric means to measure formaldehyde in biological samples. In the assay, formaldehyde is derivatized with acetoacetanilide in the presence of ammonia. The resulting fluorescent product is then quantified fluorimetrically (λexc/em = 370/470nm). The assay is simple, sensitive, stable and high-throughput adaptable. The assay can detect as low as 1.5 μM formaldehyde in biological samples. 1. What samples have you tested? This kit has been tested in blood and urine samples. 2. Can I use whole blood samples? We have done some tests in whole blood samples. In the internal standard method, the fluorescence intensity is greatly quenched so the sensitivity will be reduced by ~70X (detection limit to about 105 μM, way above typical formaldehyde concentrations in blood samples). As a result, it is not suitable for whole blood samples. - Add 100 μL 10% TCA per 100 μL whole blood. - Transfer 100 μL supernatant to clean tube and add 25 μL Neutralizer. - Follow protocol, run a standard curve in dH2O. Read fluorescence for Sample, Sample Blank and the standards. - Subtract RFU of Blank from sample RFU and multiply by 2.5 (dilution factor for deproteination). Divide corrected Sample ΔRFU by slope of water (H2O) standard curve. This method can detect as low as 1.5 μM formaldehyde (same as in H2O). 3. What is the benefit of using an internal standard? The use of an internal standard can correct for potential interference by sample matrix. 4. Will the assay kit work in a 384 well plate, cuvette, etc? Yes, the assay can be used in any standard plate and cuvette. Simply adjust the total reaction volume to your container. For 384 well use 20-90 μL, for a cuvette use 1 mL (some narrow cuvettes can hold 200-500 μL). 5. Can I store unused reagents for future use? Yes, unused reagents can be stored according to the assay protocol. Repeated freeze/thaw cycles of reagents should be avoided. Working Reagents should be made fresh for each assay. 6. Do I need to use a standard or standard curve with each assay run? Yes, it is highly recommended. 7. Will the assay react with other aldehydes? No, the assay is specific for formaldehyde and will not react with other aldehydes. 1. Zhai, R et al (2016). Evidence for Conversion of Methanol to Formaldehyde in Nonhuman Primate Brain. Analylatical Cell Pathology (Amsterdam): 4598454. Assay: CSF in Monkey (Pubmed). 2. Yang, M et al (2014). Alzheimer's disease and methanol toxicity (part 2): lessons from four rhesus macaques (Macaca mulatta) chronically fed methanol. J Alzheimers Dis. 41(4): 1131-1147. Assay: Whole Blood in Monkey (Pubmed). To find more recent publications, please click here. Please inquire or request assay service or call 1-510-782-9988 x 2. For orders of 10 or more kits, please call 1-510-7829988x1 or email us for best pricing and/or bulk order. Technical support provided by the very scientists that develop the assays. Products are extensively tested and validated prior to release so researchers need little-to-no time for assay optimization. With over 200 different products, acquire all your assay kit needs in one order. Products used by clients worldwide with distributors in over 60 countries.